« Hanging on to a win against Charlton. October had been a tough month for Arsenal with just one win in the league, (and a defeat to Tottenham in a friendly) and this was reflected in their league position. And matters did not improve in the first match of November with the third round of the London FA County Cup being an away game once again with Tottenham Hotspur. As was the club’s habit, Arsenal put out a team made up largely of reserves, and again Arsenal lost – this time 1-3. Only Pagnam and Blyth in the outfield and Williamson in goal were regular first teamers at the time. And the difficulty with winning league games continued with a 2-2 draw with Blackburn on 6 November, Buckley and McKinnon getting the goals. It meant four out of the last five league games had been drawn. 20,000 were in the crowd. Arsenal remained 16th. Away from the playing of the game Sally Davis reports that on 8 November many of the senior members of the club attended a dinner given at the House of Commons hosted by Baldwin Raper, Arsenal’s local MP who apparently was a regular at Highbury and an avid fan. Sir Henry Norris, Charles Crisp, William Hall and George Peachey were also all in attendance representing the board along with Leslie Knighton, secretary Harry John Peters and the majority of the regular first XI. Sir Henry’s speech reflected his view that Arsenal had to be seen as a business if it was to survive. The following Saturday saw the return match with Blackburn and the result was an improvement: an Arsenal victory by 2-0 with 40,000 in the crowd, many there to see the famous Dr Paterson make his home debut. One thing that was interesting about this match was that due to a very high number of injuries Arsenal’s regular goalkeeper played at full back. White and Pagnum scored. The programme for the game spoke of no club ever having such an injury list as Arsenal. This programme, which is perhaps the oldest Arsenal programme in public circulation is numbered Volume IX Number 16 and costs two pence (that is 2d, which is under 1p in modern currency). 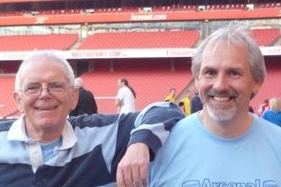 It’s a four page affair and it contains the normal editorial bits by Gunners Mate (George Allison who went on to become our manager, and who had started writing the column in 1910). There’s also a piece by Dr “Pat” of Highbury, and “Random Jottings” by the chairman of the Middlesex FA. The back page has the teams laid out in the classic formation of 2-3-5. There’s also an advert for the Finsbury Park Empire, which emphasises the link between Henry Norris and the world of entertainment that we noted in our previous article. The programme also includes a whole column about the game against Blackburn which was the previous weekend, pointing out that Arsenal were unlucky not to have a penalty, and criticising the press reviews of the match of being inaccurate. At least the club in those days had the ability to speak out. “Illness and injuries are still playing havoc with our fighting force as you know. Hutchings and Graham were not able to play against Blackburn Rovers. I am not certain if Rutherford will be fit to turn out today but we hope so. Voysey, Cownley, Butler, North, Jewett, Hopkins, Dunn and Walden have also been out of action and Dunn, whose sprained wrist prevents him keeping goal, has been keeping fit by playing at full-back. He had a trial run in this position in a friendly match with Reading a fortnight ago and acquitted himself so well that he was in the team at full back against Clapton Orient [in the London Combination] at Highbury last Saturday. This game was considerably marred by the fog but it was possible to finish it and our juniors came out of their shell to the extent of winning by 6 goals to 2. Dr Paterson has his first name and initial given to indicate his is an amateur. The result on 13 November of Arsenal 2 Blackburn Rovers 0 was seen by many football writers as indicative of their improvement since August: a good win on a pitch made treacherous by morning rain. Arsenal were now 14th. Then, in a moment of supreme significance to everyone who lost a friend or family member during the war on 10 November the body of The Unknown Warrior arrived from France aboard HMS Verdun for burial in Westminster Abbey. The following day King George V unveiled the Cenotaph and the Unknown Warrior was buried. The following Saturday 20 November the result was Huddersfield Town 0 Arsenal 4; an excellent result and was Arsenal’s eighth match without defeat. This was the first time Arsenal scored four since the resumption of football after the war. Pagnam got two, within a run that gave him seven goals in four games. Arsenal were 10th, just five points off the top of the table. But the war in Ireland continued, and got bloodier by the day. On 21 November the IRA shot the Cairo gang, fourteen British undercover agents in Dublin, most in their homes. In immediate retaliation the Royal Irish Constabulary opened fire on a crowd at a Gaelic Athletic match in Croke Park, killing thirteen spectators and one player and wounding 60. On 22 November Sally Davis reports that Sir Henry Norris asked two questions during question time in the House of Commons: the first about rent rises on Regent Street; and a second about cheap railway fares for groups travelling to sports fixtures. These had been a regular feature pre-war but had been stopped during the war and not re-introduced. Meanwhile demonstrations were occurring throughout the country by the unemployed demanding rises in benefit pay. The government was not sympathetic. On 29 November rationing that was imposed during the war was finally ended with the removal of restrictions on the sale of sugar.